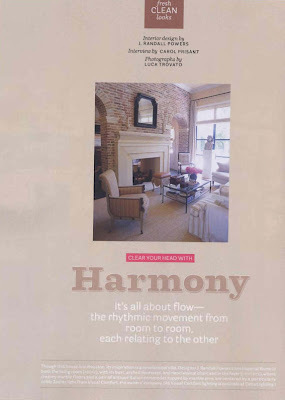 The August issue of House Beautiful features the largest spread it has ever done on a home and it happens to belong to Andy Singer, the founder of Visual Comfort Lighting and his wife, Gayle. Those of you who a regular readers of La Dolce Vita know that my husband has the pleasure of working for Visual Comfort. The funny thing is, Andy's house is being published in a few magazines and he is notoriously modest and doesn't like being the center of attention. The house, which was completed within the last year is situated in one of Houston's most beautiful areas. 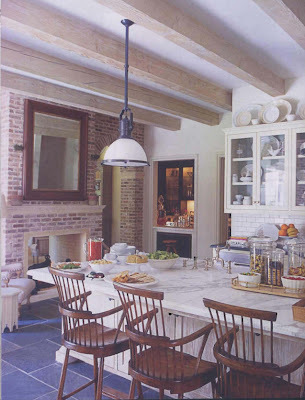 The interior was designed by J.Randall Powers, whose own home was featured in Elle Decor last year. J.Randall drew inspiration from the city of Rome and modeled the home after a neoclassical villa. His aim was to create a space which was beautiful, edited, and most importantly, comfortable. He and the Singers felt it was extremely important for their home to feel comfortable and livable, a refuge from the hustle and bustle of their daily lives. The house is dressed in a soothing and serene palette and feels homey, but very grow-up all at once. 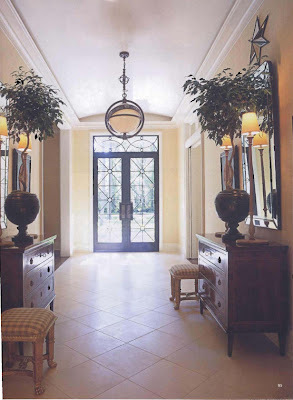 Visitors are greeted by a beautiful set of custom doors, a massive Visual Comfort Zodiac pendant, creamy marble floors, and Italian antiques. The large living room is part of a two-page spread. Powers makes its massive size work by creating two smaller sitting areas. The floor is covered in grass matting in this room, while two wooden Italian busts stand guard over the space. The family style kitchen melds together old and new. The Visual Comfort Country Industrial Pendants are modeled after a vintage style, while the room is filled with antique copper cookware and vintage ironware. The sunny breakfast room feature exposed brick walls, a beamed ceiling, an antique walnut table accompanied by a banquette and upholstered chairs. The guest bedroom features several engravings of Roman architectural fragments and a bed upholstered in paisley fabric. The Pimlico bedside lamps are also by Visual Comfort. The limestone floors, alabaster urns, and carrara marble counter tops in the master bath are meant to reference the materials used in ancient Rome. 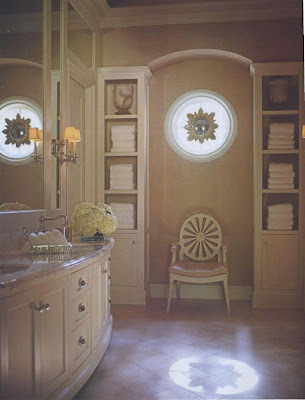 A vintage starburst mirror hangs in front of a circular window. The master bedroom also features engravings of Roman ruins, a theme which persists throughout the house. Both the bedding and the bed itself are dressed in fine stripes. J.Randall opted for a leather settee at the foot of the bed because he felt an upholstered bench would "look too staged". All Visual Comfort products are available through their sister company, Circa Lighting. I am drooling all over my keyboard. Just beautiful! I haven't received my House Beautiful yet. Now I shall tackle the mailman!!! 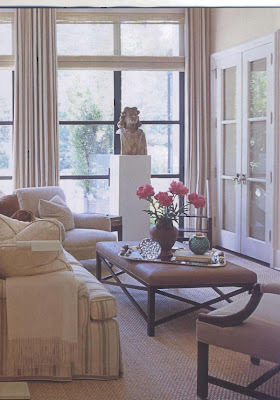 I love the architecture of this home...all of the tall windows and doors, which enables so much light. Do you know who the architect is? Thanks for the sweet comment on my blog! I have been travelling much of the last month, but will be doing a post in the next day or two. Last summer, I was home almost all summer (and was able to start my blog), but this summer I am gone 80%! I must admit, I am enjoying this summer much more than last summer. I love to travel! Thank you for this lovely entry! 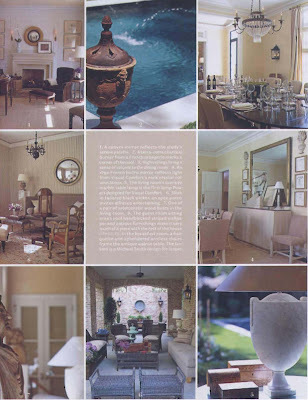 I love the large marble table lamp in the bottom right corner of the vignette page, & I don't see it at Circa. Any clue if it is available? Thank you for your comment. The large marble lamp is part of J.Randall Powers' new collection for Circa. You can contact Kym, the Houston showroom manager at713.526.4100. Just describe the lamp and let her know you saw it here. She'll know exactly what you're talking about and can give you all the details.